Jada is a beautiful grey merle pit bull who came all the way from North Carolina to Pennsylvania for a better life. Her story is a sad one up until now. Jada is a young lady who has had too many puppies in her life! Now she is spayed and happy that she doesn't have to go through that again. Now she has hope for a good life and happiness with her person or a family who will give her love and a happy home. We first learned about Jada from Paul Nadler at Rural Shelter Transports. They asked us to take a group of dogs that were going to be euthanized at a high kill shelter due to lack of space. Jada was the one female in the group that was pregnant. From what we know she was surrendered to the shelter by her previous owners - pregnant. Typically owner surrenders are the first dogs to be euthanized because there is generally not a holding period required. If a dog comes in to a shelter as a stray, most shelters will hold the dog for at least 3 days to see if the owner comes looking for it. In Jada's case, her days were numbered along with those of her unborn puppies! I first met a nervous but friendly Jada at a rest stop off of Route 83 in Maryland. She was tired but she seemed to know that better days were ahead of her. I loaded her in my Toyota Prius along with two other very nice dogs and we headed for the shelter in Pennsylvania. Once at the shelter Jada collapsed with exhaustion until the next day. Day 2 she was tired and didn't have much patience for any of the other dogs at the shelter. Who knew - she looked like she was ready to give birth that day. I decided that Jada needed some alone time to prepare for her puppies. I brought her to my house and made a very comfortable dog spa for her in my garage. Each day Jada would waddle around the yard with her enormous stomach full of little tiny lives. She was very nice from the very first moment we met. We waited for two weeks with this expectant mother. She seemed relaxed and happy. I was anxious. On Tuesday June 20th I went in to clean up and prepare breakfast for Jada. She was laying on her side with a tiny black puppy beside her. No breakfast necessary. I spent the entire day with Jada making sure she was okay as she delivered puppy after puppy after puppy. It was truly miraculous! This sweet dog who was so close to being killed was now bringing life to so many puppies. I had never witnessed a dog having puppies before and I could not bring myself to leave her alone for a moment. As a mother, she was amazing. She took care of each and every puppy like a pro. We suspected that this was not her first time having puppies. That day Jada delivered 14 beautiful puppies between 8 am and 630pm. It was amazing! For the next 14 days we watched closely over Mom and puppies to be sure everyone was healthy and moving. The puppies soon opened their eyes and began to move around slowly. By week 3 they were starting to walk on wobbly legs. As I picked one up for the first time I noticed tiny black fleas crawling on the little puppy. Immediately I called our vet to see what we should do. Then we set up an assembly line of washing and combing each puppy to get rid of the fleas. They were so young all we could do was wash them with a little blue Dawn dishwashing liquid and water. Then the flea comb came out to get rid of every flea. Fortunately there weren't that many and they were completely gone in just 3 days. At six weeks the puppies were really on the move, running around their playpen, playing and poor Jada was attacked for milk each and every time she entered the playpen. Jada was a trooper about feeding her kids. She knew it had to be done often, no matter how much it might have hurt her to endure their sharp little teeth and brand new claws. In the evenings I would wash Jada's belly and then give her coconut oil to help with the puppy abrasions. At eight weeks the puppies had their first set of shots and soon they were ready to be adopted. Within a couple of weeks all the puppies went to their forever homes and Jada was able to get some much needed rest. After all the puppies were gone Jada had an appointment with the vet to get all of her shots up to date and surgery. She did well and she the turned into a young playful dog. 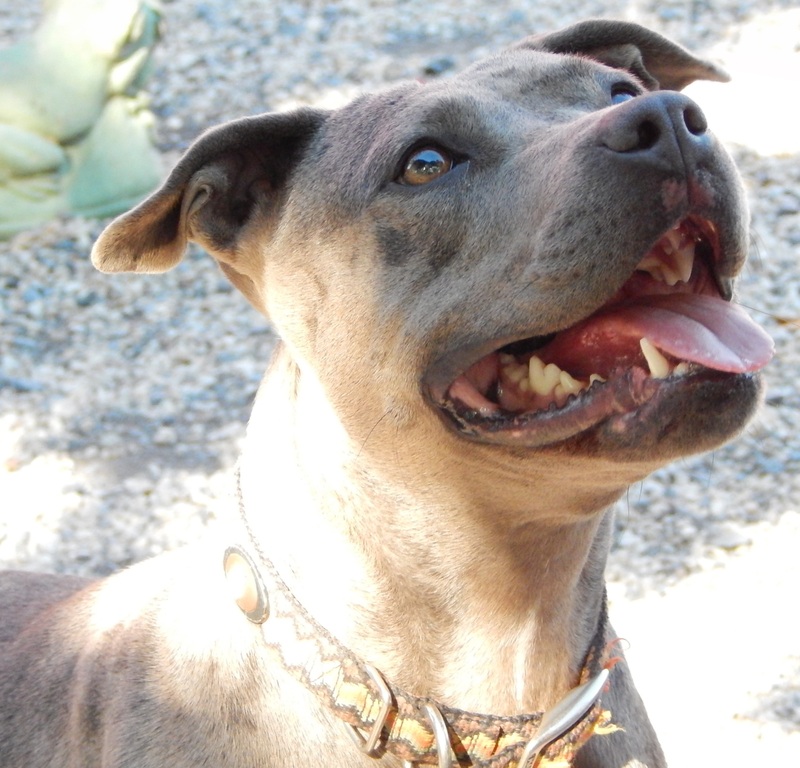 Jada loves to chase a ball, cuddle up or just be around people. She is a beautiful dog who is desperately seeking a home. Can you help Jada find her home?